Si desea leer la noticia en español haga clic aquí. In an increasingly globalized economy, innovation, technology, brand and digitalization become the indispensable engine for the opening of new markets. Aire Networks as operator of telecommunications wholesale services recognizes the importance of these key elements within its business strategy. El Mundo. 17.09.2018. Thanks to the growth that Aire Networks has maintained during more than 17 years of national trajectory, it has been consecrated as the fourth national operator, being one of the companies with greater presence and capillarity in the metropolitan and rural area in Spain. This progression has led Aire Networks to expand its borders in order to offer its products in the international market. The innovative character of Aire, promotes and accelerates its competitiveness, since it invests in the recruitment and retention of qualified human capital in its production structure, continuously boosting research, development and innovation to generate new products and services with which to satisfy the present and future needs of the market. R+D+I projects have emerged that generate a competitive advantage for the company. One of these projects is its technological platform for the diffusion of audiovisual contents: PERSEO TV. PERSEO TV, is the brain of a new multiplatform interactive television ecosystem that allows customers to manage their own television platform in an easy and intuitive way, perfect for IPTV, OTT and hybrid configurations, as it connects all elements in a single end-to-end integral solution, based on seven basic pillars that are fed back to guarantee the best experience: Accuracy, Security, Personalization, Simplicity, Recommendation, Monetization and Growth. In addition, it allows to offer television contents with standards and features of latest generation, improving the customer’s consumption experience, reducing costs and maximizing profits thanks to its convenient interface, its customization options and its administration panels. PERSEO TV is the result of more than 5 years of development of the engineers of the R+D+I department of Aire Networks, led by four big talents who stand out in their respective areas: Carolina Badía (Android & STB); Rubén Correoso (Big Data & Analytics); Ángel Fuentes (IOS & SmartTV) y Adrián Mengual (Backend & Security). With this platform, Aire Networks places in the international market a powerful means of difussion content comparable to the development of other brands, such as: Tucano by Alpha Networks or TIVO. The international technological event in Media, Entertainment and Technology, will bring together more than 57,000 professionals from more than 170 countries. For all of this, IBC is the ideal showcase to inform the global market about the latest technological innovations in terms of media, since the convention allows visitors not only to know the latest technologies, but also to touch, test, compare and make firm orders, because it is an exceptional space to do business. IBC is an ideal medium to promote in the international market all the novelties of the technological platform for the diffusion of audiovisual contents, Perseo TV. Aire Networks will also be present at the next edition to celebrate on September 19 and 20 in Madrid. The event is an excellent gateway to the Hispanic-American market. 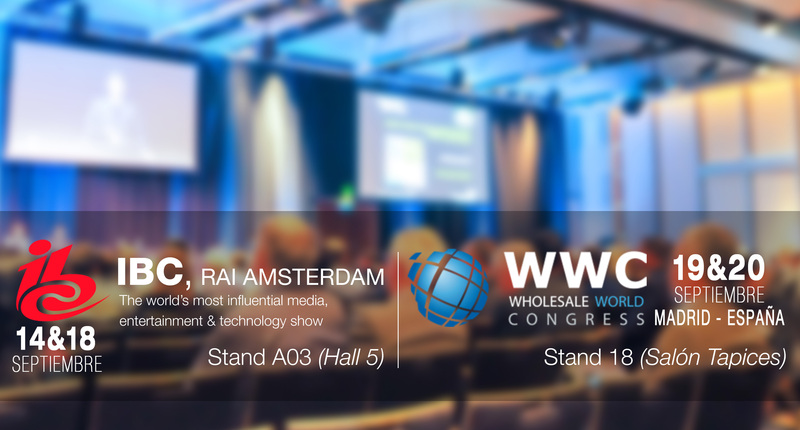 In this edition of the Wholesale World Congress, Aire Networks will be presented to the international market as a TIER 2, announcing its wholesale connectivity, voice, television, housing and security services. Aire Networks, the national telecommunications operator that provides wholesale Quadruple Play solutions, profitable, flexible and scalable for operators, entities of the public administration and companies in general. Among its multiple assets there are its know-how, its strong national and international interconnection agreements with the main sectoral actors and its own telecommunications network with more than 27,000 km and a transport capacity of 1.2Tbps. With its network it covers 90% of the Spanish territory through fiber optics and radio links. Its firm commitment to R+D+i not only favors the creation of new products, but also favors the research, development and innovation of solutions that guarantee the quality and stability of all the data circuits that connect to the network of Aire with the distribution point of its customers, providing clean traffic, low latency and great stability. From its R+D+i laboratories at Elche Parque Empresarial and Parque Científico de Murcia, Aire Networks develops various research programs on artificial intelligence, speech, facial, text and image recognition; neuronal trees, smart home, machine learning, transcoding, app development, among others.